Living in the country, like we do, there are many nights we spend watching the stars and staring up into the dark sky playing amateur astronomer. So to see a whole website combining astronomy with photography, we were absolutely thrilled! 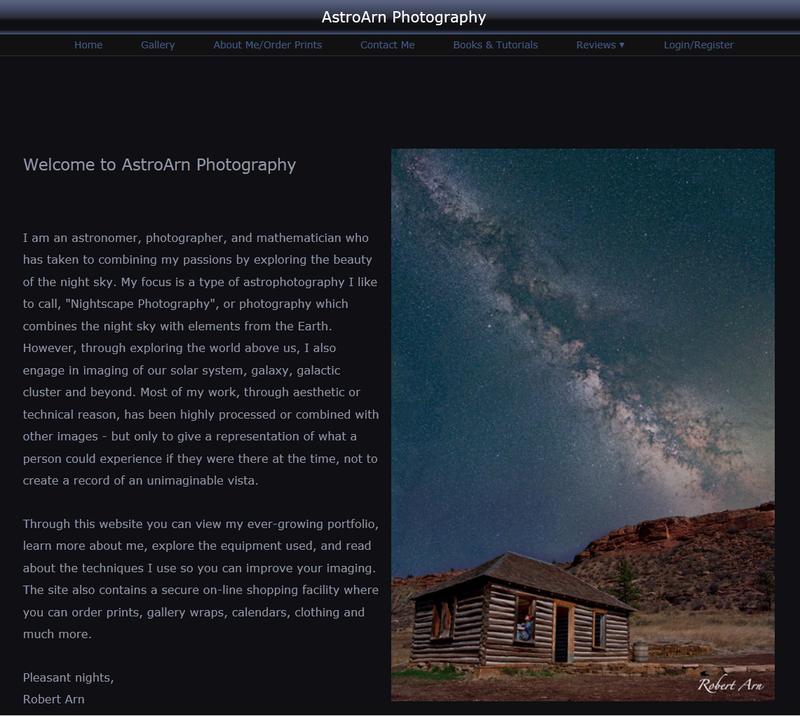 Robert Arn is an astronomer, photographer, and mathematician who now churns out his own type of astrophotography, he calls "Nightscape Photography." 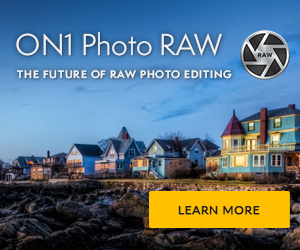 Obviously, he prefaces his work stating that with this type of photography, there is always going to be processing and image combinations to achieve the final product. And they are amazing pieces of work. We encourage you to roam around within his galleries checking out what we miss with the naked eye in the midnight sky. 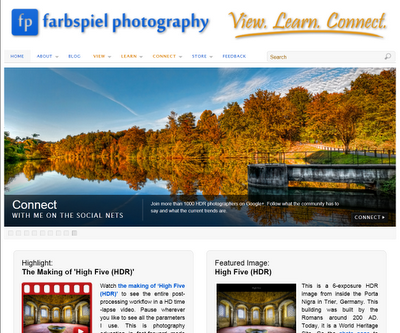 Photography Blog - Farbspiel Photography - View. Learn. Connect. Klaus Herrmann specializes in High Dynamic Range (HDR), panorama, and vertorama photography. 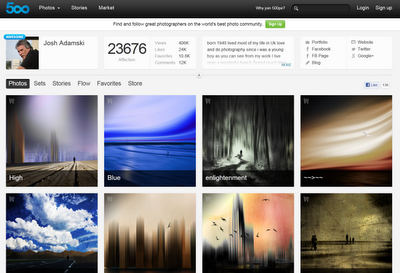 You say, what is vertorama? This type of photography consists of multiple exposures that cover the scene in a vertical direction and then stitched into a single image. In fact, a great tutorial can be found here: Taking Interior HDR Vertorma Shots. 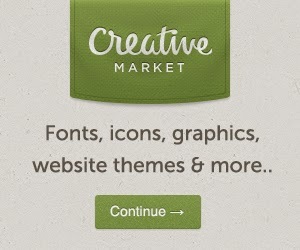 And you will find many more tutorials like that on Klaus' blog. 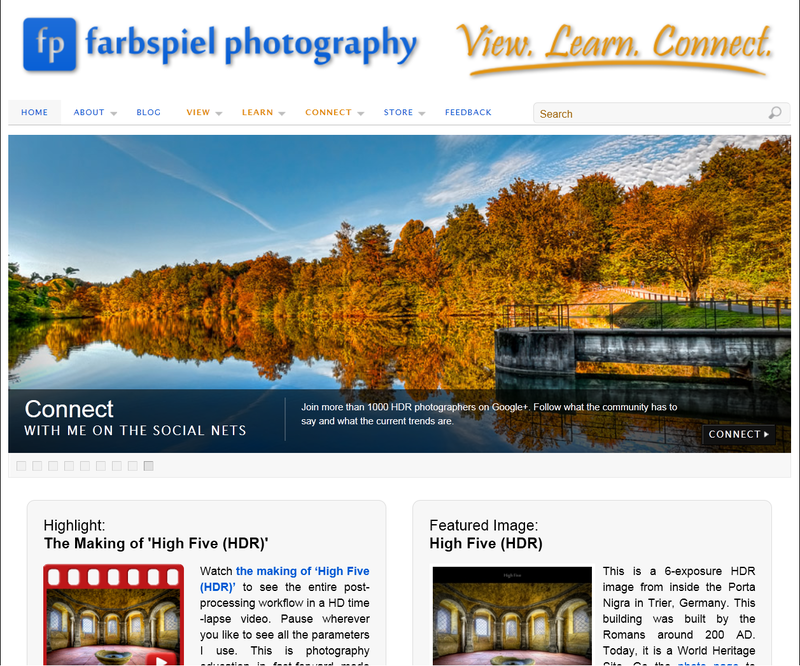 Farbspiel Photography has had a solid background in providing "text-based recipes or tutorials" but now have moved into making video-based tutorials including their own You-Tube channel. Hopefully you'll take the time to review all the different tutorials and HDR recipes provided by Farbspiel Photography, but we encourage you to at least take the opportunity to read: 21 HDR Photography Myths Busted. I like Klaus' take on the best way to learn, is to debunk some myths about a subject. 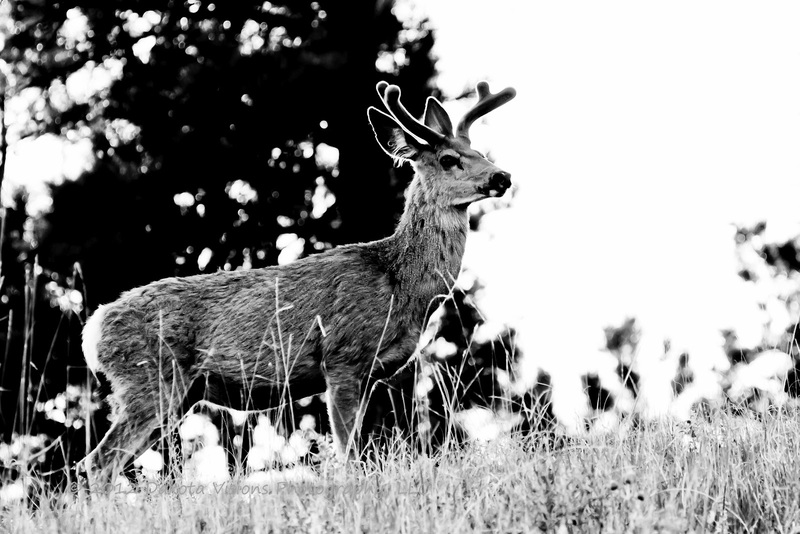 We are looking forward to following more of Klaus on video! There are still antelope that are carrying their young, but for the most part - the young antelope are out in force in Custer State Park. 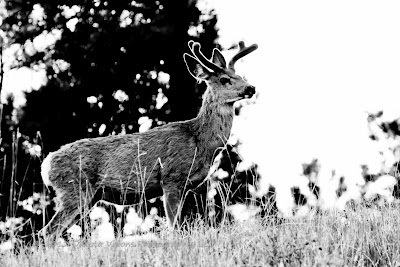 For this weekly photography challenge we chose to focus on the young ones. "Mom, mom...MOM! 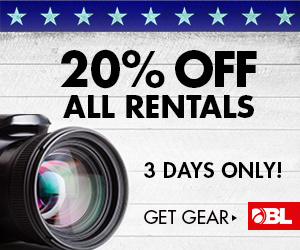 There is a crazy guy with a camera running around over here. Aren't you going to do something, Mom...?!" 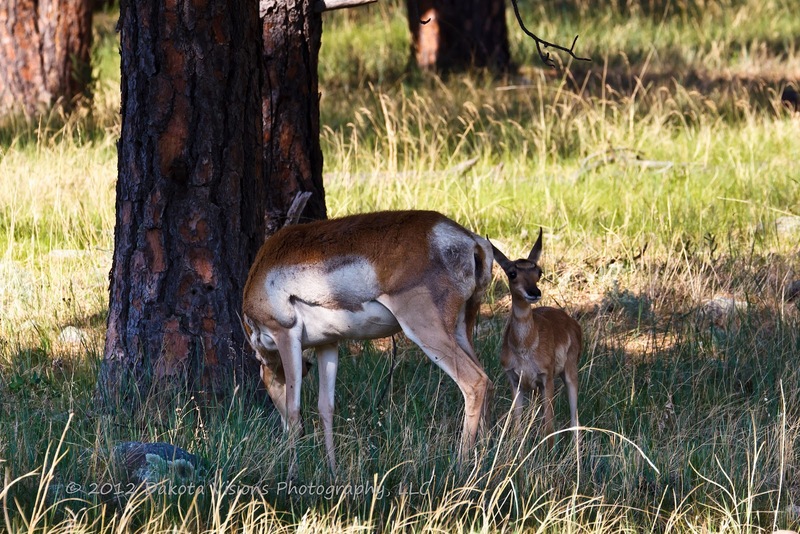 The still pregnant antelope are generally kept at arms length from the young antelope. This mother with her young antelope almost immediately left the area when the other pregnant antelope showed up in this clearing. And who can resist those big eyes of a young antelope?! 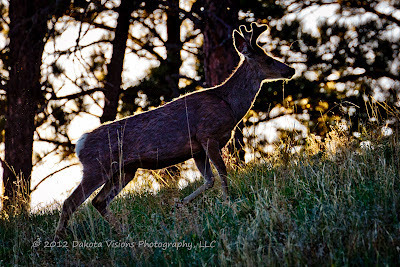 One of the greatest times to be roaming around Custer State Park is during this wonderful season of the animals raising their young. 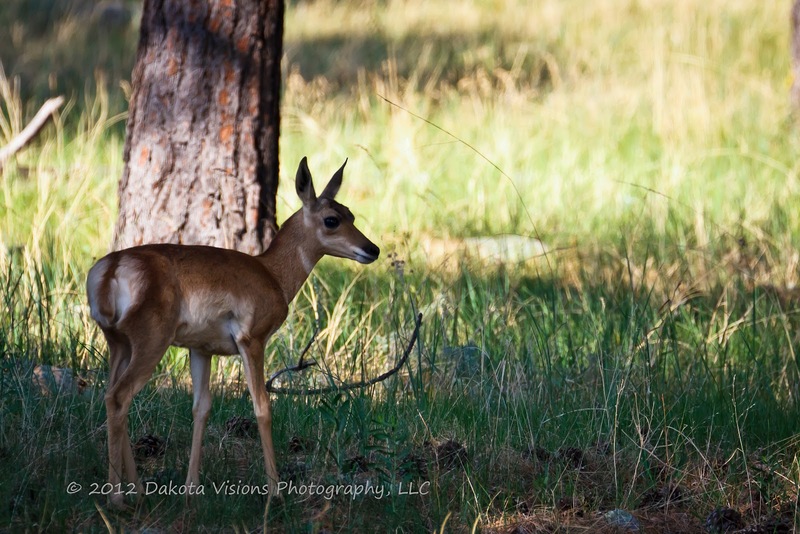 We hope you enjoyed the photographs of the young antelope roaming Custer State Park. Keep an eye out for more photographs of the antelope, deer, and buffalo young! If you have any 'Y' photographs to share for our weekly challenge, just put the link to your photograph in the comment box below. 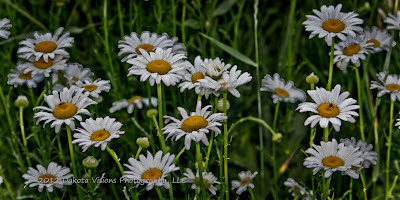 Join us next week's photography challenge finding something starting with the letter 'Z'. Huh?! You thought I wouldn't be able to come up with an 'X' photograph this week?! Well, we fooled you - xylem it is. For those of you who remember your high school biology, think of it as the xylem and phloem vascular transport tissues in plants. It's basic function is to transport water, but it also transports some nutrients through the plant. So enjoy the 'outside view' of the xylem and phloem of wild daisies, ferns, and snow on the mountain plants. The xylem transports water and soluble mineral nutrients from the roots throughout the plant. 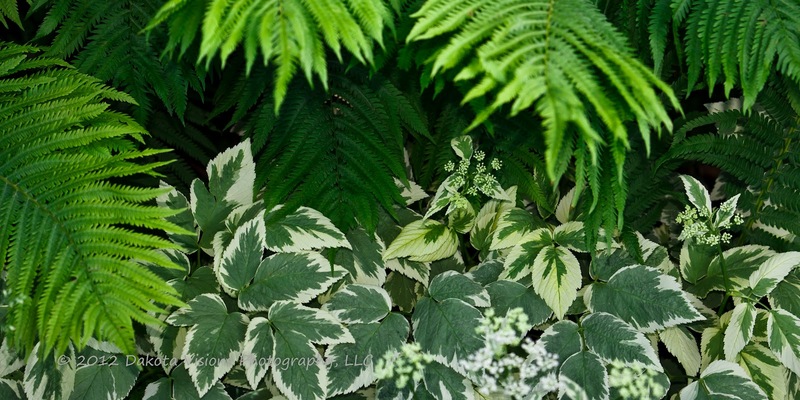 It is also used to replace water lost during transpiration and photosynthesis. And one more quick biology lesson, if you can remember your school biology lessons - you'll remember that there are two reasons that water or sap flows in the xylem: transpirational pull (resulting from the negative pressure of evaporation) and/or root pressure (a positive pressure caused by osmosis). Well now that your head is spinning, we'll drop the science lesson and move on to the letter 'Y' next week. If you have any 'X' photographs to share for our weekly challenge, just put the link to your photograph in the comment box below. 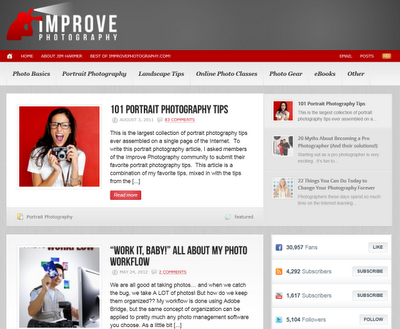 Join us for next week's photography challenge. 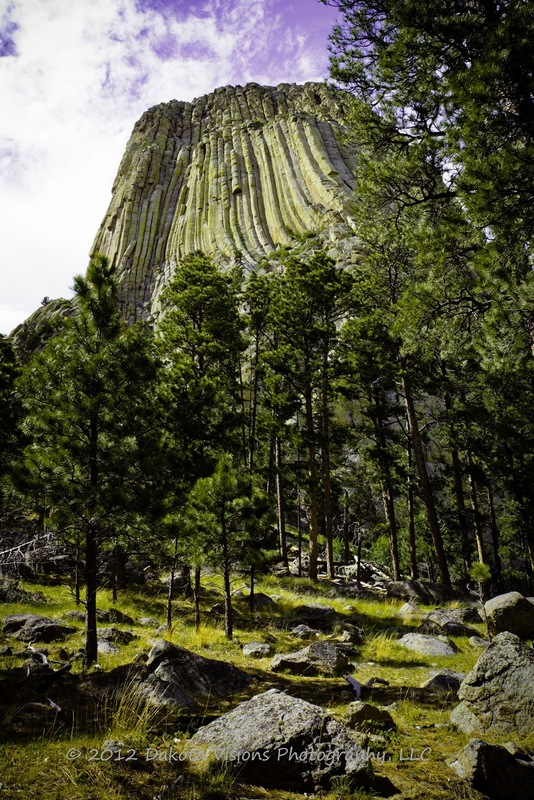 Whether you call it an igneous intrusion or laccolith, Mato Tipila or Wox Niiinon, the 1,267 feet of Devils Tower creates a feeling of awe and drama. President Theodore Roosevelt declared this the first United States National Monument on September 24, 1906 because of its beauty, splendor, and dramatic properties. The monument's boundary encloses an area of 1,347 acres and has close to 400,000 annual visitors. Whether you visit as a reminder of the 1977 movie Close Encounters of the Third Kind or to be one of the 1% of visitors to climb the summit reaching 5,112 feet above sea level, this monolith continues to draw people from around the world. 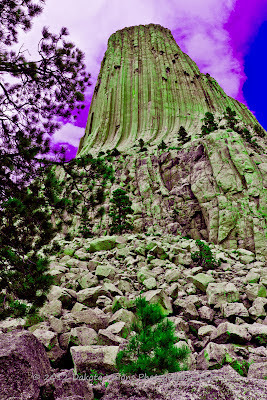 Devils Tower did not visibly rise out of the landscape until the overlying sedimentary rocks eroded away. 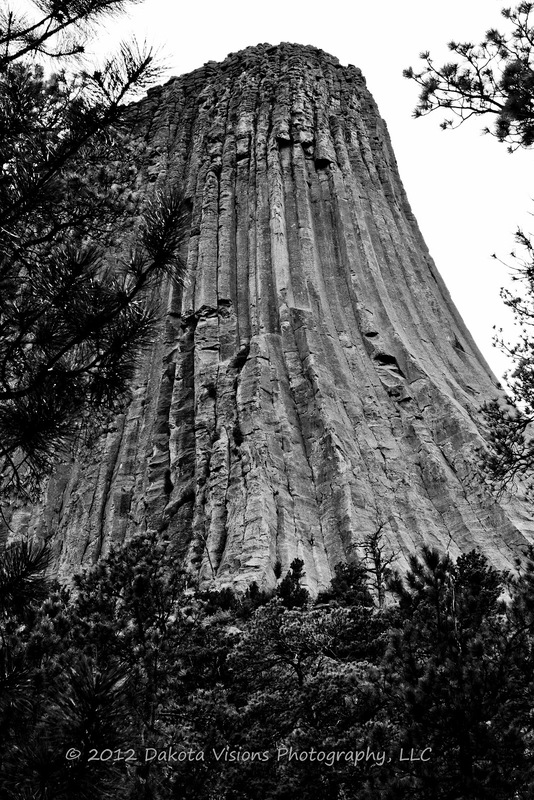 As the elements wore down the softer sandstones and shales, the more resistant igneous rock making up the tower survived the erosional forces. Even today, the cracks along the columns are subject to water and ice erosion. 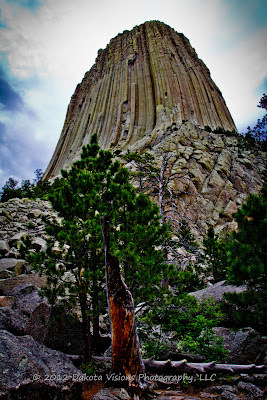 Pieces, or even entire columns, of rock at Devils Tower are continually breaking off and falling. This scree - or piles of broken columns, boulders, small rocks, and stones - lies at the base of the tower indicating that it was once wider than it is today. It is believed that Devils Tower got its name in 1875 when Colonel Dodge's translator, on a scientific survey, misinterpreted the name from the local Native Americans to mean Bad God's Tower, later shortened to Devils tower. Some Indians call it Mato Tipila, meaning Bear Lodge. Other Native American names include Bear's Tipi, Home of the Bear, and Tree Rock. 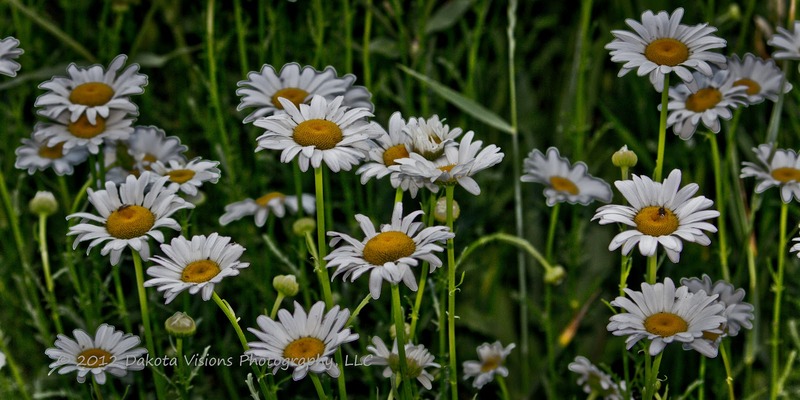 What photograph do you take with the letter 'U'? 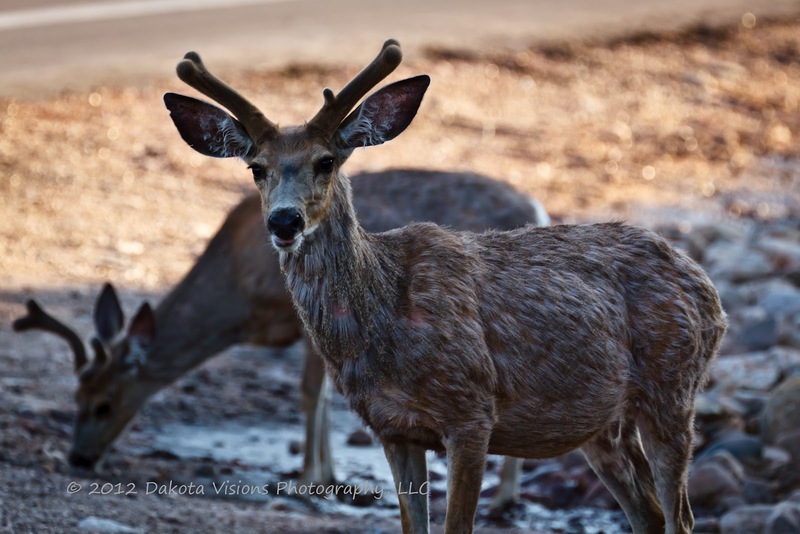 It is birthing season for the wildlife in Custer State Park - udder?! No, no, no...we went for 'underground animals' and 'under mama's care' for this week's photographs. 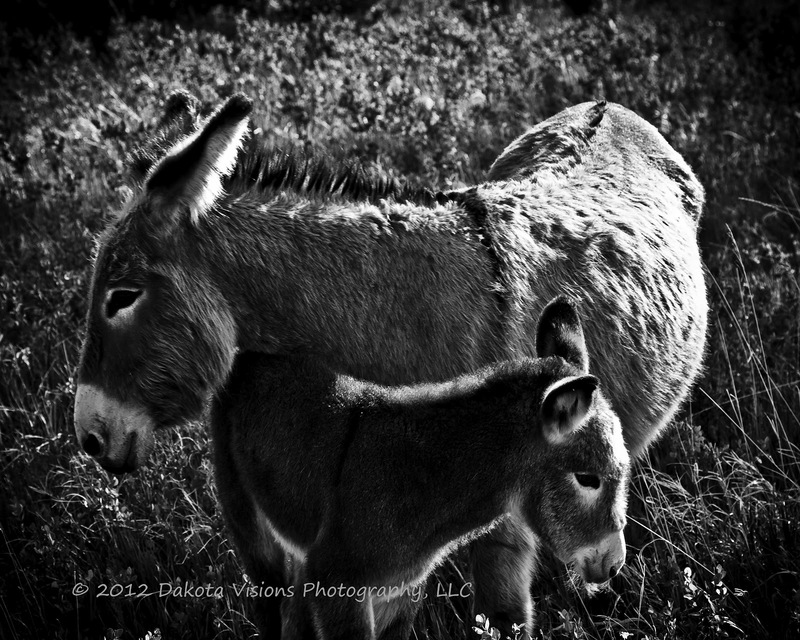 We hope you enjoy the prairie dogs and feral burros this week. 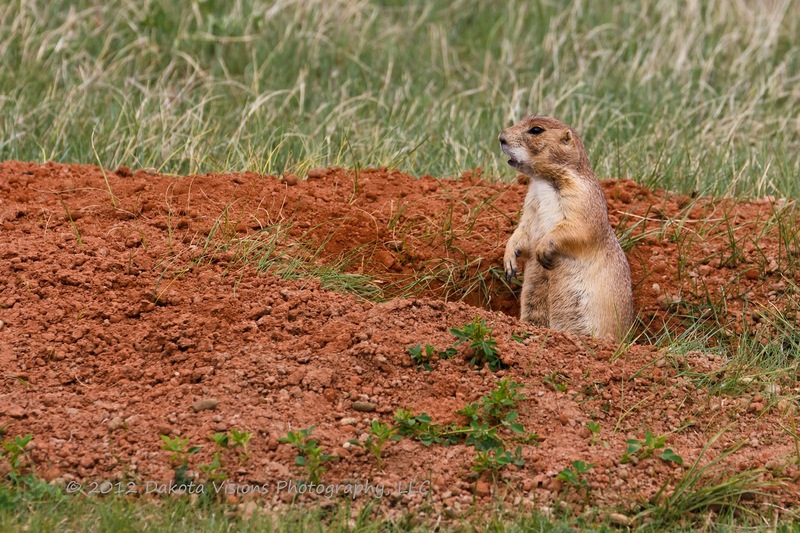 On a trip to Devil's Tower this weekend, we encountered what some see as the 'scourge of the earth', while others see as cute, little furry animals - the prairie dog. 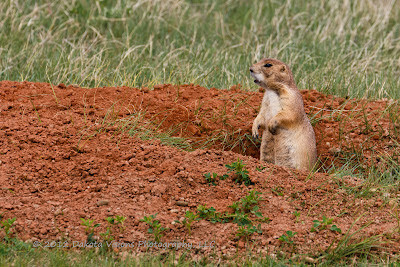 Prairie dogs are burrowing rodents native to the grasslands of North America. 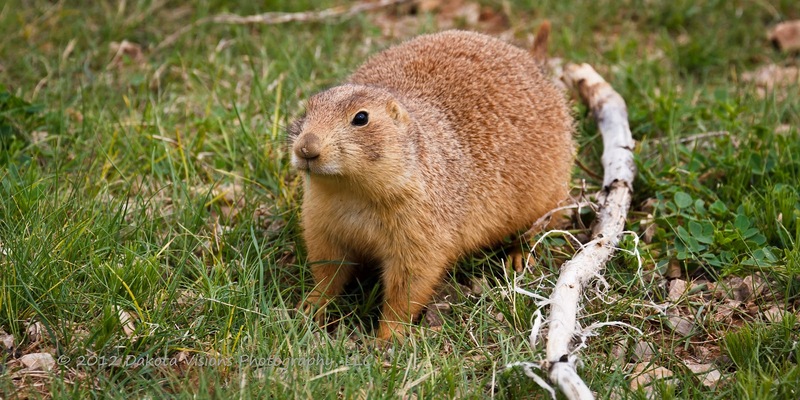 Prairie dogs are named for their habitat and warning call, which sounds like a dog's bark. 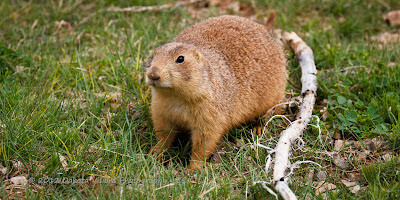 The rodents were first described by the Lewis and Clark Expedition in 1804, saying they had "discovered a village of an animal the French call the Prairie Dog." Lewis described it later in more detail as the "barking squirrel". And who could resist a young, feral burro under the protection of it's mother. If you have any 'U' photographs to share for our weekly challenge, just put the link to your photograph in the comment box below. 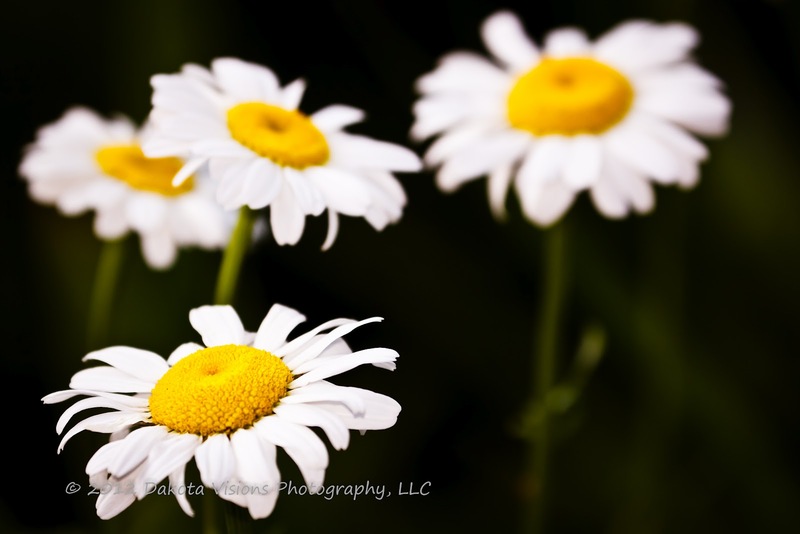 Join us for next week's photography challenge finding something starting with the letter 'V'.